Assumed 1st printing. The book states "Berkley Medallion Edition, May, 1970" but does not have any printing # indication. The cover is coded S1837, the spine has 425-01837-075, and the copyright page states "SBN 425-01837-7". The cover artist is not credited nor is a signature visible (Lehr ?). Each of the of the stories in this anthology was chosen by the author and has a foreword or afterword explaining the writing process and/or why they picked the story. These essays are titled "Comment on ..." and are not listed in the book's table of contents. One exception is Diplomatic Coop by Daniel F. Galouye where he chose to write an additional "surprise ending" for this reprinting and thus the Comment on Diplomatic Coop essay that explains the background of the ending is between the end of the original story and the additional text. 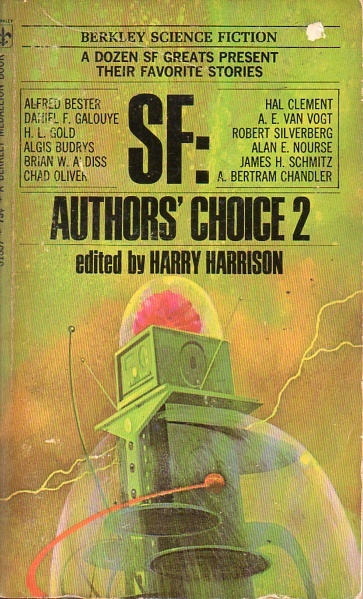 Although the title is stated as "SF: Authors' Choice 2" on the cover, title page, and spine some Internet sites list this as "SF: Author's Choice 2".